Police are searching for this man. 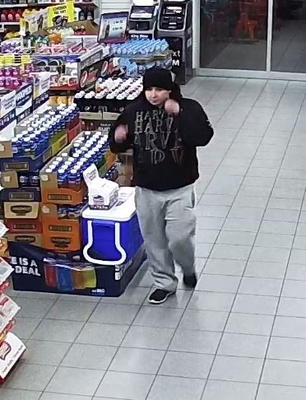 Police have released CCTV from an armed robbery in Dandenong North in a bid to find the man responsible. He arrived at the Stud Road Liberty service station just after midnight on Tuesday 29 November, pressed a buzzer and was let in by staff. Once inside he put on a balaclava, produced a large knife and demanded cash from the till. The staff member handed over the money and the man left the store. He was described as Caucasian and aged between 20 and 30 years old, and was wearing a black hooded top, grey track pants and black runners. He was seen nearby getting into a dark-coloured car, possibly a Hyundai Getz. Call Crime Stoppers on 1800 333 000 or submit a confidential crime report at www.crimestoppersvic.com.au with any information. CCTV captures a man as he puts on a balaclava before the robbery.